We have an inside joke in our house when it comes to choosing flavors. 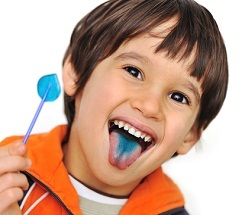 Whenever it’s time to decide on a flavor of sport drink, snow cone, lollipop, cotton candy, Kool-Aid, or cupcake my littlest one’s favorite is always blue. I usually tease her asking if she wants “blue-flavored”. If you have kids you know that one of the most popular flavors they like usually involves something in a shade of blue. Depending upon the food item in question, you may get varying interpretations on what flavor the blue represents; blue raspberry, wild berry, blueberry, berry blend – you get the idea. Food manufacturers understand the universal kid-appeal of blue foods so they have carefully manufactured foods in an appealing shade of blue and added a manufactured flavor to create a ‘blue-taste’ experience. Naturally, my children have questions about the flavor each of the colors represent in various types of foods and how they get their flavor. Their questions about flavor got me wondering, too, about how flavors are concocted and which of our foods have been flavor enhanced. What I uncovered through my investigation was an entire other world of food science that surprised me. Scientists have identified six major types of taste that humans can detect; sweet, sour, salty, bitter, astringent (puckering and dry – like unripe bananas or quince), and savory. They’ve also determined that 90% of our sense of taste comes from our sense of smell. The experience of taste happens when volatile compounds (gases) are generated by the cooking and/or crushing of food in your mouth, which travel inside your nose, or up the back of your throat, where your extremely sensitive olfactory nerves detect the compounds. Have you ever noticed the slight delay between taking a bite of food, chewing it and then experiencing its flavor? Without being able to detect the scent or aroma of food, taste is essentially meaningless. Think back to the last time you had a cold – do you remember not being able to smell or taste your food? Flavor chemists use a variety of techniques to capture the volatile compounds released by natural foods. The idea is to preserve them in non-volatile form so they can be introduced into processed foods. The commercial processing of foods is relatively recent historically and freezing, canning, and drying food tends to drain the flavors out of them. The natural, volatile compounds that make up the aromas of fresh foods are, of course, volatile, so they don’t last long, especially when packaged and preserved. In order to increase the palatability of processed foods, food manufacturers turned to artificial flavoring and it’s been a resounding success. It is estimated that 90% of the money that American consumers spend on groceries goes toward purchasing processed food. It’s easy to understand why; even though the cost may be a little higher, the foods will keep longer so you lose less food to spoilage. The fact that processed foods have been made to taste as good (or better) than unprocessed foods makes it hard for fresher foods that spoil much more quickly to compete with those that have a long shelf life. Most flavor additives are obtained by capturing volatile compounds from existing foods. Ingredients used to create flavor additives are generally considered safe by the FDA, so they don’t have to be reported in detail on food packaging labels. The number of compounds used to create a single flavor, such as strawberry, is incredibly complex. Most of the names of the compounds are unfamiliar and would be essentially meaningless to the rest of us outside the flavor industry. Strawberries are a seasonal fruit, only available for a few weeks during the spring, so adding strawberry flavoring to some processed foods extends the duration of the strawberry-enjoyment season to year round, where you can have it in milkshakes, ice cream, and even bubble gum. What I found most shocking in my investigation was that 90% of our money buys processed, not fresh, foods. With flavor-enhancing, preservatives, and plastic packaging I wonder whether the perceived value of processed food has contributed to the obesity epidemic we’re seeing. Almost all of the processed food we buy has flavorings added to it, which begs the question; are Americans overeating because of the over-flavored foods we buy? Perhaps it’s time science investigated appetite and portion control in processed versus fresh food diets to see if all these yummy flavors are expanding our waistlines!